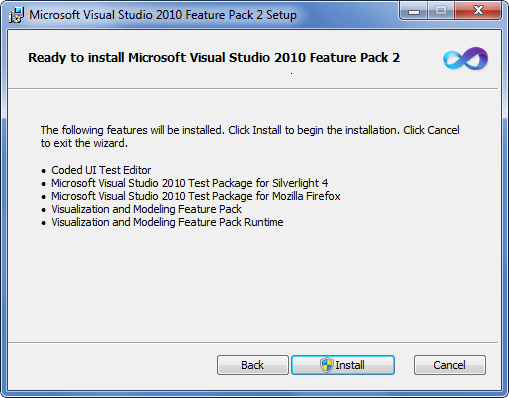 Feature Packs enable you to extend Visual Studio 2010 with capabilities that enhance and complement the existing tools. Visual Studio 2010 Feature Pack 1 (“Visual Studio 2010 Visualization and Modeling Feature Pack”) features will be included in Feature Pack 2. Feature Pack 2 enables you to expand test coverage of platforms for your applications through world-class tool support. Microsoft Visual Studio 2010 Feature Pack 2 brings more advanced platform and tool support for both manual and automated testing scenarios, leveraging Visual Studio 2010 Premium, Visual Studio 2010 Ultimate, or Visual Studio Test Professional 2010. The Visual Studio 2010 Feature Packs download page will be updated the day the Feature Pack is released (next couple of weeks).